Our Oil Special layflat hose is an Electro-conductive all synthetic layflat delivery hose complying with DIN 14811. The hose is a two-component system consisting of a black NBR synthetic, electro-conductive rubber inner lining resistant to oil and fuel. The external jacket is made up of a synthetic polyester bonded together with NBR-synthetic adhesive. The hose is finally colour coated black and given a polyurethane coating which increases its abrasion resistance. The Oil Special layflat hose is characterised by its lightweight, flexible and kink resistant structure produced with very low twist. 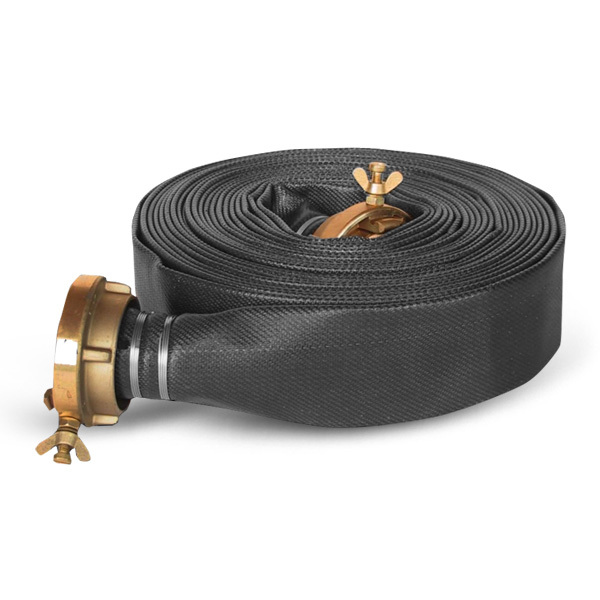 The Oil Special layflat hose is principally used by Municipal fire brigades, Industrial fire brigades, within the shipboard and marine industry, on refineries and construction sites, and underground mining. The hose jacket is a 100% polyester high tenacity yarn with circular woven, warp threads 2 ply twisted, twill with 3 interwoven copper wire braids. The hose lining and cover is a two-component system consisting of a black NBR synthetic, electro conductive rubber inner lining and a synthetic polyester outer jacket, bonded together with NBR-synthetic adhesive. Resistant to ozone and to external contact with oil and fuel. The lining guarantees a smooth surface and low friction loss. It complies with DIN 14811 and is Electro Conductivity tested by PTB. It is to be coupled with Storz system. Note: The special inner lining of Oil Special allows coupling to be attached with the need to make direct contact with the copper wire braids. The coupling are wired-in for safety and security, with 1.6mm Stainless Steel wire.